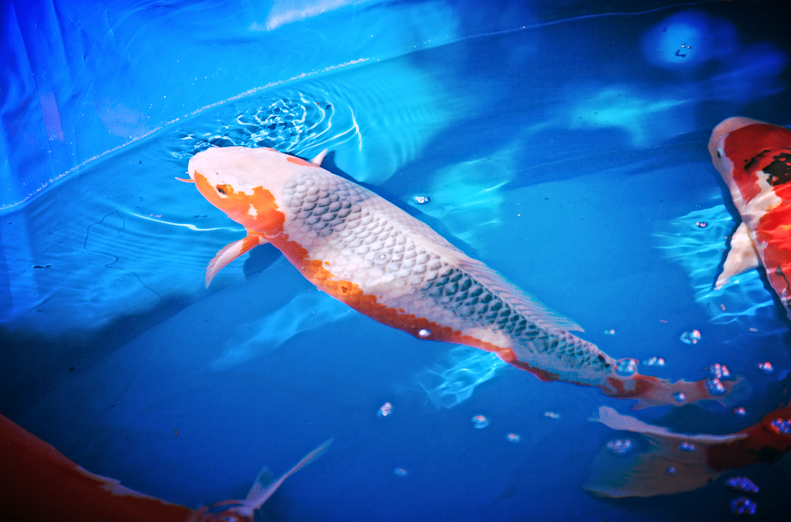 The Asagi is one of the oldest breeds of the beautiful koi. Stoic and subdued, and sometimes even considered an acquired taste, you’re sure to see this common blue-scaled koi around in a pond near you! The Asagi is one of the oldest breeds of koi. Asagi offspring tend to be a spitting image of the typical Asagi koi – blue nonmetallic scales, reticulated diamond-like scale pattern, and splotches of red coloration, called hi. These appear on the gill plates, belly, and tail. These red areas can also appear on the koi’s dorsal fin. The red hue that develops in Asagi koi is less of a bright red and more of a rusty color. The hi sometimes spreads as koi age. Asagi koi that have more red pigmentation than usual are called Hi Asagi. Another variation on the typical Asagi koi is called Taki Asagi. These koi look just like your typical Asagi, but they have an additional line of white scales between its red and blue pigmentation. Red eyes are also desired in Asagi koi. While Asagi koi produce many typical offspring, few are seen as perfect or faultless. This is one reason why the Asagi koi are recognized as an acquired taste. In the ideal Asagi koi, symmetry is favored. This oftentimes disliked requirement in koi is actually admired in the Asagi lineage. The symmetry that is idealized in Asagi koi pertains to their red patches. The red areas should be defined and clean – any spotting or straying of red pigment on the head or scales is recognized as an imperfection. And because the blue scales are so distinct, any patches of missing scales are very apparent and are seen as a major fault. For the ideal Asagi koi, red eyes are desired. A flawless Asagi koi has a perfectly white head. However, these koi most often have grey toned heads. Sometimes the head develops red pigmentation. The koi is then considered to be a Menkaburi Asagi, a variation of the Asagi koi. When picking out a young Asagi koi, inspect the tip of the nose. If it is free of splotches and blemishes, the head may very well develop to be clear as well. In many cases, when the head is light in color and spotless, the skull can be seen through the skin in young Asagi. Don’t worry – the koi will grow out of it. The Asagi koi is blue-scaled and nonmetallic with patches of red pigmentation. The ideal Asagi’s back is covered in blue scales with a light blue tint near the base of the scale that blends to a darker shade in an ombre-like fashion. Contrast between the light and dark on each scale is idealized. If you have a young Asagi koi whose scales seem lackluster, don’t worry. These scales develop deeper and more intense hues as the koi grows. Generally, lighter blue Asagi are preferred over darker ones. Are you an Asagi koi keeper? Send us your photos via the contact form!